If you have a garden, yellow squash is probably coming in fast and thick. 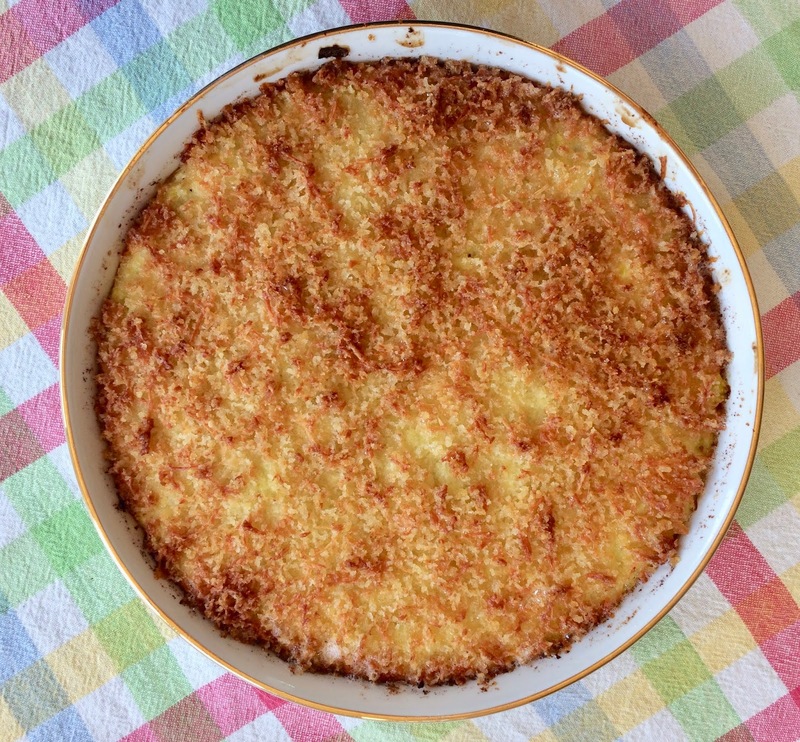 My friend Karen Hines recently brought me a dish of her grandmother's Baked Squash. 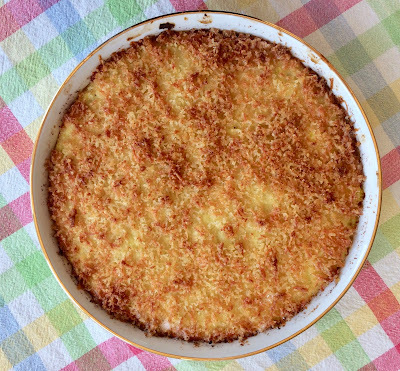 We gobbled it up, and I asked for the recipe, which I'm sharing with you today. 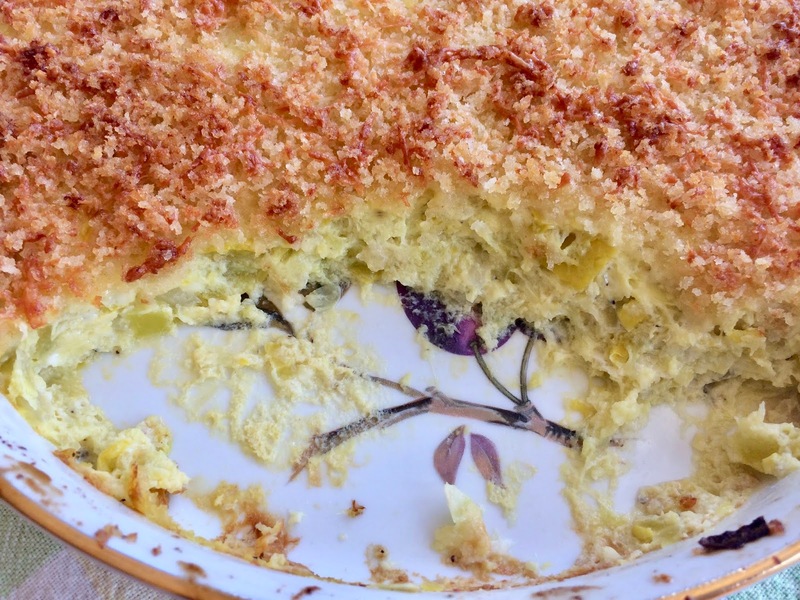 Karen's grandmother, Mabel Lester Furrow, baked this in the summer when squash was plentiful, and it takes Karen back to the summers of her childhood and her beloved grandmother. The original recipe makes a huge amount so I made half of it, which is plenty to serve four people as a side dish. I also added a little bit of cheese because I happened to have it on hand. But that's entirely optional. What I love about this old-fashioned recipe is that it's healthy and light with a nice crispy topping. 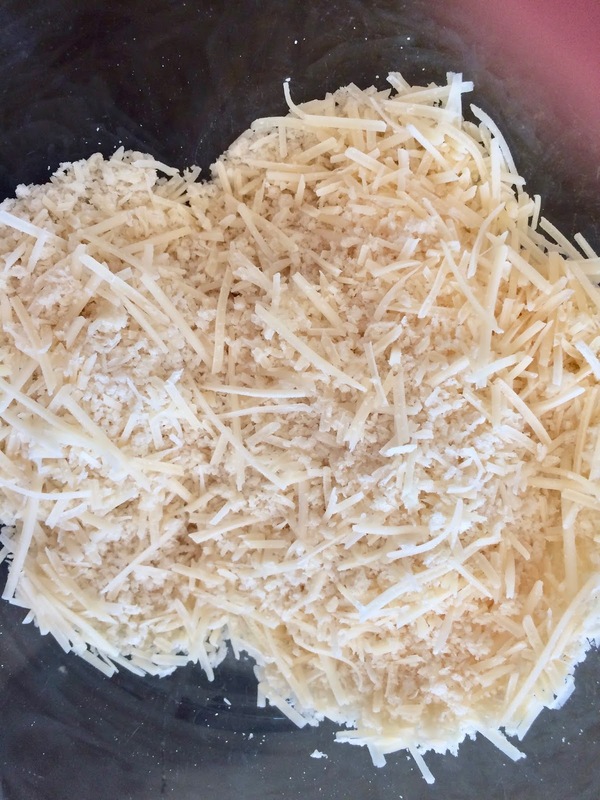 Don't be afraid to omit the cheese. It's delicious either way. I've listed the amounts in the original recipe in parentheses in case you're baking for a crowd. Note that the quantity of eggs remains the same, even if you make the halved recipe. The original recipe calls for baking it at 375. I was in a bit of a hurry and baked it at 400, which worked great. I think this would be a wonderful recipe for someone who is learning to cook. It really doesn't matter how you cut the squash because it will be mashed anyway. Steaming is easy. And most of the mixing can even be done by hand. I used one super large and one small yellow squash. The squash should be around 1 1/2 pounds in weight but I think the recipe is forgiving if you err a little bit either way. Butter the baking dish. Wash the squash, cut it up, and steam until tender. Drain off the liquid. Mash the squash. Mix with onion, pepper, eggs, sugar, salt, and Jack cheese. Pour into pan and spread out. 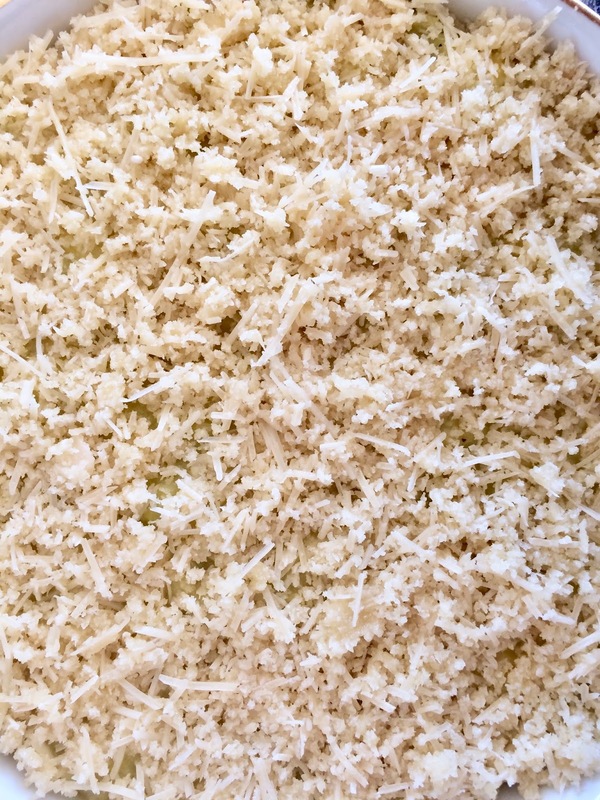 Melt the butter and mix with Panko and Parmesan. Sprinkle lavishly over the top. Bake at 400 for 30 minutes or until it bubbles and the top is golden. Steam or boil the cut squash. Mix with onion, eggs, seasonings, and a little cheese. 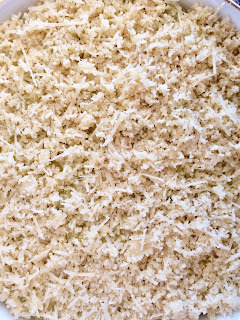 Mix the Parmesan with the Panko and melted butter. 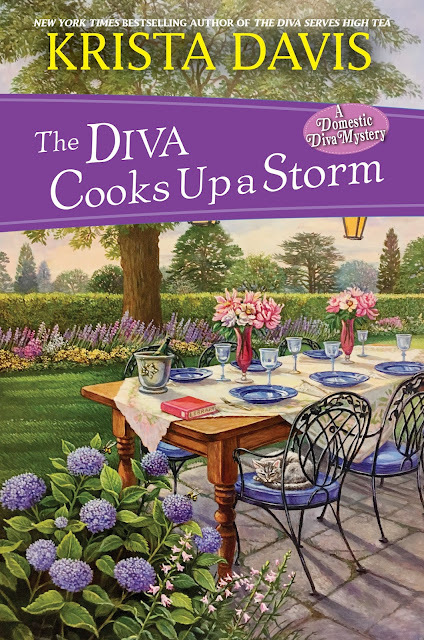 Have you read THE DIVA COOKS UP A STORM? I'm giving away a copy today to one person who leaves a comment. Don't forget to leave your e-address so I can contact you if you win. Yummy! I love yellow squash. This looks easy and delicious. Looks sooo good! Looking forward to reading Cooks Up a Storm. I am always looking for ways to use up squash. It looks decievingly sinful with the topping! I am looking forward to reading the new Diva book! Thanks! I love the cover of your book. How nice it would be sitting there having a meal. 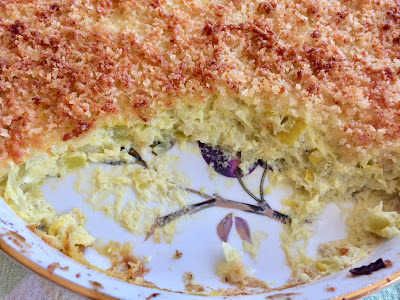 My mom's squash casserole was always one of my favorites. This recipe sounds really good! I'll have to try it. I have not read your book yet, but it is on my To Read list. Thanks for the chance to win! This recipe looks very tastey! I love your books...right now I'm reading Color Me Murder. 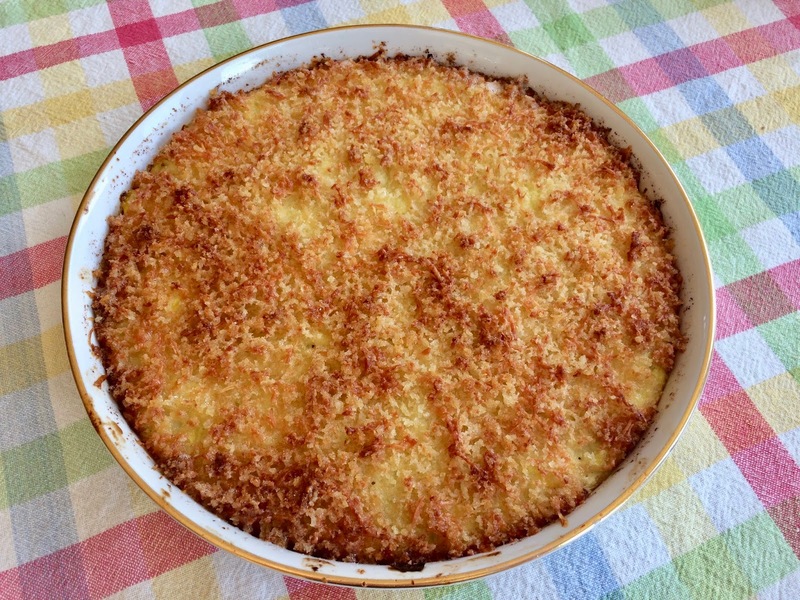 I love squash casserole! I think it’s a requirement if you live in the South. Sorry to say I have not yet read THE DIVA COOKS UP A STORM. This is a great recipe, another way to enjoy the squash that I sometimes forget I enjoy so much. Thanks! Yummy....that recipe looks and sounds so good! Thank you for this chance as I would love to read a copy of this book! Congratulations, Cherie! You are out winner! I have not read Cooking Up a Storm, but would like to. Recipe looks good! Can you substitute butternut squash? dm _ richards (at) yahoo (dot) com Thanks! This looks delicious. Thanks for the chance. Oh, and Divas, my magic swag bag is running on fumes again. Could I bet a refill of bookmarks from all of you?